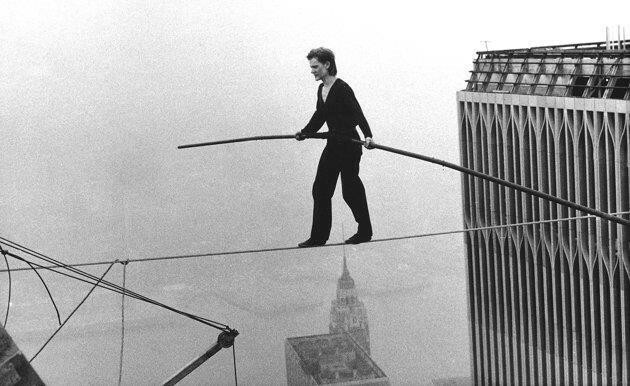 On 7 August 1974, French high wire walker, Philippe Petit, fixed a wire between New York’s World Trade Center towers in order to walk, run and dance between the two buildings - 1,350 feet above the ground. Documentary, Man On Wire, tells the story of how Petit and his team managed to plan, prepare and achieve this remarkable and frankly terrifying feat. Unsure What Film To Watch Next? Click Here! 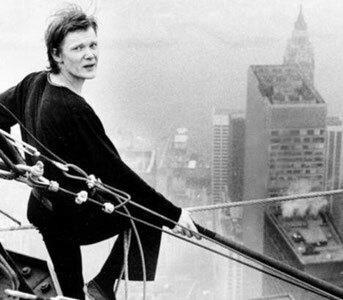 In advance of seeing the The Walk, the new Robert Zemeckis film about Philippe Petit’s daring New York wire walk, I decided to watch James Marsh’s 2006 documentary on the event. I did this because I wanted to hear the story from the man himself and get a sense of who he was, why he was driven to do what he did and how he managed to persuade so many others to help him. This last point was, for me, the most interesting of all. Why would they become involved in something so dangerous? Why were they willing to risk so much for Petit? Petit is a highly articulate and extremely charismatic person. His excitement and passion for wire walking is contagious. I could see how this magnetism would have inspired the faith and loyalty of his team. And he really needed them all in order to stand a chance of making his dream/obsession come true. His friends and girlfriend (Annie Allix) helped him both because he inspired them and, deep down, because they knew that he would do it with or without their assistance. Allix explains that Petit “could no longer carry on living without having at least tried to conquer those towers because it felt like those towers belonged to him. It was as if they had been built especially for him”. Of course, being scared of heights as I am, the whole event fills me with horror. Just looking at the photographs of Petit makes me feel nauseous. I can barely stand to look. Of course, the wire walk itself is only part of the story. Before Petit could take his first step, he had to get a tonne of equipment to the top of both towers - all without being caught by security. This side of the story is almost like a thriller, indeed it is likened in the film to a bank heist. Petit expected to get caught at every stage (at one point he had to hide underneath a tarpaulin as a guard patrolled the floor). Despite the fact that I knew the outcome, I felt so tense as Petit’s team got ever closer to their aim. And, even though I knew that he survived the event, my pulse was racing as he started his walk. Man On Wire has added poignancy, of course, in the light of the terrible events that took place in New York in 2001. The footage of the towers being constructed really took my breath away - at times it looked like a scene from after the attacks. I watched the construction workers piece together the two towers and felt that familiar wave of sadness. For me, the filmmakers made the right decision to avoid any discussion of what happened to the towers. In a way, Petit's story honours the towers without the film having to say a single word. 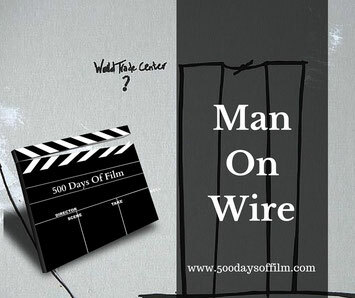 Man On Wire is a fascinating, exhilarating and poignant film. I am really glad that I watched it before The Walk as I now have a better understanding of what inspired Petit and his team to do the impossible. Man On Wire's story is told by the filmed recollections of many of the main players and also via dramatic reconstructions. Now, I don’t usually like such reconstructions but here they fit seamlessly into the story. Listening to Petit talk about why he decided to walk between the two World Trade Center towers made me think about the obsession that drove the climbers of Everest. They all have a need to push themselves to extremely dangerous limits. I am quite glad that I don't have that need. I am now really looking forward to watching The Walk as the recreation of Petit’s high wire event looks phenomenal. Will probably be watching through my hands as those heights are terrifying!